The image is of the extract from the baptism register, showing a birth dated 25 November 1799 with an embossed stamp dated 11 November 1802 to mark the date of the extract. The birth recorded on the certificate was of Floris Noach Bellingan in Driel, Gelderland, Netherlands. He had an elder sister Maria born on 16 September 1798, who died around 1804 in South Africa. (PDF version 1.3 MB: ). 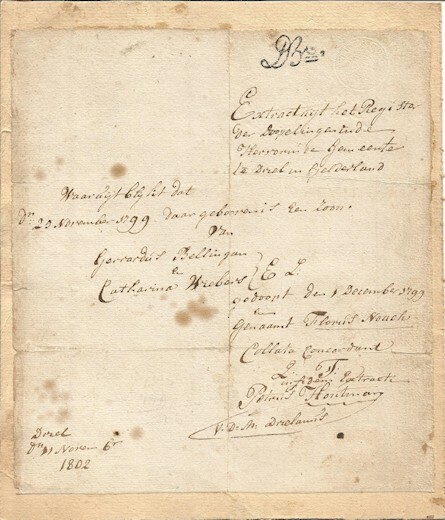 We believe that Floris Noach travelled to South Africa with his parents, Gerardus Bellingan (1774 - 1832) and mother Catharina (nee Wiebers, 1749 - 1832) together with the Jansens & de Mist party, arriving in Cape Town on 23 December 1802. Under the treaty of Amiens (25 March 1802), Britain, restored ownership of the Cape Colony to the Batavian Republic (the Netherlands, who had controlled the Cape from 1652-1795) and de Mist was to become Commissary-General, take control of the Colony from the British, and install the new Governor, General JW Janssens. (Britain re-occupied the Cape in 1806). On 11 February 1826 Floris Noach (1799 - 1870) married Maria Cornelia Marais (1810 - 1881), daughter of Daniël Petrus Marais and Dorothea Maria Terblans, at George, in the Cape Province. Their first child, Gerardus, was born in February the next year. They had 16 children and those children in turn, had around 50 children of their own.